Normally I would tag a post like this one under "humor" or roll it out on 4/1. But this isn't April Fool's Day and this is not funny. There's an app almost ready to be launched for street fighting enthusiasts called Rumblr that allows users to scroll through other prospective scrappers who wish to engage in a fist fight. I kid you not. 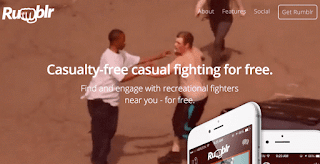 Rumblr is an app for recreational fighters to find, meet, and fight other brawl enthusiasts nearby. Anonymously choose which members you want to fight. Get matched with others who want to throw down. Arrange and schedule fights right inside the app. Explore nearby fights and filter by fight type. Scope out your opponents with detailed statistics before fighting. Stats on fighters would include age, height/weight, experience and "MMA Specialty." Getting "called-out" is almost a rite of passage for adolescent males. And fights in inner cities are common, obviously. But organized fights broadcasted on social media will likely draw crowds and possibly gangs. This is a sobering thought. Check out some of the images on the Rumblr site. Before we get carried away with visions of gang warfare, realize that this app was primarily designed to setup one-on-one matches. Hopefully, this app doesn't survive. Between the possibility of lawsuits and the detrimental effects to already blighted environments, this cannot end well. Maybe those nunchuck wielding cops from the west coast could show up at a Rumblr event to straighten these thugs out.